This Feb. 7, 2018, file photo shows the Charging Bull sculpture by Arturo Di Modica, in New York's Financial District. 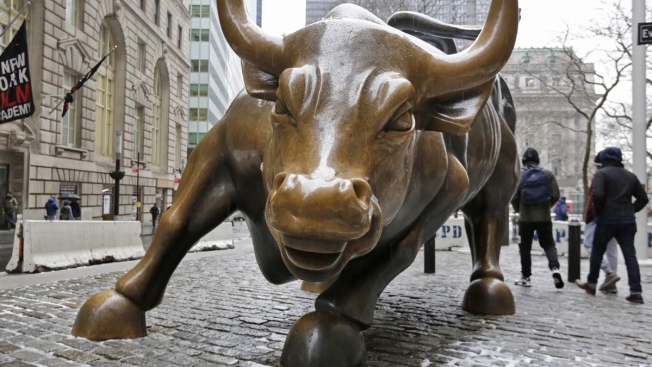 The stock market’s near decade-long climb upward since the depths of the Great Recession turns nine years old Friday, March 9, the second longest U.S. bull market since World War II. The bull market turned nine Friday, extending a run that began in the depths of the Great Recession. The stock market has had several corrections since March 2009, which is when an index like the S&P 500 falls 10 percent or more from a recent high, most recently in February. But the stock market has not fallen 20 percent or more from a recent high, which is when a bull market becomes a "bear" market. The S&P 500 would have to fall roughly 600 points from its current level in order to enter a bear market. While there are several risks to this current bull market, including the possibility of higher inflation and a trade war caused by President Donald Trump's tariffs on aluminum and steel, most investors believe the current market isn't at risk of falling into a bear market any time soon. Companies are benefiting from the recent tax law passed by Congress and the overall U.S. economy is growing and unemployment is at record lows. So far, it's a happy occasion for the bulls. Just before 11 a.m. Friday, the S&P 500 was up 30 points, or 1.1 percent, to 2,769, after the government said U.S. employers added 313,000 jobs in February, the most since July 2016.